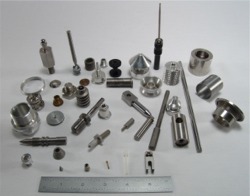 Specializing in automatic screw machining and production turning, we provide precision CNC production machining using state-of-the-art equipment and techniques. At the same time we retain and utilize methods and principles of the traditional machine tooling craft, mastered, developed and perfected over our many decades of continuous operation. We can provide engineering support to help solve design and manufacturing problems. We frequently perform secondary machining operations and the assembly of components including epoxying and applying coatings. We sub-contract heat treating and grinding/finishing. We can machine customer supplied material and have the capability to offer secure handling of proprietary materials. You can count on our professionalism to refuse a project if we feel we can not do it to the very highest standard. We will then assist you in finding someone we feel would be best suited to the project.